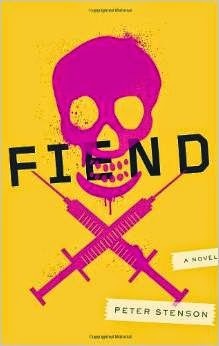 A Nurse and A Book: Fiend by Peter Stenson..or.....WTF did I just read??? Fiend by Peter Stenson..or.....WTF did I just read??? To an ER nurse, there's many patients worse than a meth head, especially one who is spun and has no desire to get clean. And not many meth heads desire to get clean - the old joke, how do you know a junkie is lying? He's talking. So when I received a copy of Fiend from Blogging for Books in exchange for an honest review, I was a little taken aback, because I don't have much interest in junkie monkeys, but then I figured why not try my first ever zombie apocalypse book. I loved I Am Legend, I'm a Walking Dead fan, but I've never read any of the books - and I know the book is always better than the movie. The difference between these movies and Fiend is that Fiend has no clear hero. Chase and his friend, Typewriter begin a their journey of survival, taking a detour to rescue Chase's ex-girlfriend and true love, KK, who dumped him because he wouldn't stay clean. The real kicker is that now she isn't clean either, but she still didn't come back. Chase figures out pretty quickly that the antidote to the zombie virus is meth. He tests his theory on KK's new junkie boyfriend, and a injection of meth brings him back from the brink of zombiehood. Why would Chase bother? Good question. The answer is because Chase still has a trace of hero in him. The positive is that the zombie apocalypse has made chasing meth legit because it's the only way to stay alive. The negative is that now you're chasing down drug dealers while dodging the "Chucks", so named because they giggle as they try to eat your face. This book was completely unlike anything I have ever read. It was completely intense, and I felt like I was holding my breath most of the time while I read it. But I also felt vaguely dirty reading it, as if I was plunged into the mind and reasoning of a junkie - which I was, because the character was really well written. My next read is going to be a nice, sweet, chick lit book. Because this was a gritty read. But very well done.